The Albertus Magnus Center for Scholastic Studies is happy to announce that registration is now open for the July 2017 summer theology program in the town of Norcia. This will be our sixth summer program since 2011. We are especially excited to be studying the sacraments, with a close look at baptism and the Holy Eucharist, through the lens of Book IV of the Commentary on the Sentences of Peter Lombard by St. Thomas Aquinas, which has some of the Angelic Doctor's most extensive and intriguing discussions of sacramental theology from his entire career. The tutors will be Fr. Thomas Crean, O.P., Christopher Owens, and Peter Kwasniewski. Fr. Cassian Folsom, O.S.B., the founding prior of Norcia, will join us for a lecture and conversation. 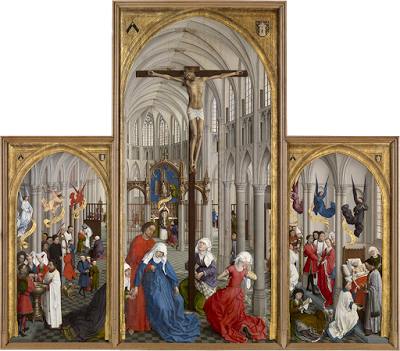 Thomas' Commentary on Sentences IV"
"These are the sacraments, in which, under the cover of visible things, divine power works our healing in a hidden way, as Augustine says." The theme for the 2017 Summer Program is Sacramental Theology. We will be undertaking a close reading of selected texts from the Commentary of Aquinas upon the Fourth Book of the Sentences of Peter Lombard. The Sentences was the standard "textbook" of the 13th and 14th century University of Paris, and all bachelors were required to write a commentary. Thus, in this work we find the thought of a relatively young Thomas Aquinas, having begun his writing of it at around 28 years of age. He sent his Word and healed them, and delivered them from all their destructions (Ps 107:20). By the sin of the first man, the human race incurred two things, namely, death and infirmity. Death, because of its separation from the principle of life, of which it is said, with you is the font of life (Ps 36:9); whoever is separated from this principle necessarily dies, and this happened through the first man. Hence it is said, by one man sin entered the world, and by sin, death (Rom 5:12). But a sufficient remedy could be obtained for this only from the word of God, which is the font of wisdom on high (Sir 1:5) and, accordingly, the source of life: for wisdom endows its possessor with life (cf. Sir 7). Thus it is said, as the Father raises up the dead and gives life, so the Son also gives life to whom he will (Jn 5:20). The word is the power of God, by which all things are upheld: upholding all things by the word of his power (Heb 1:3). And this is why it is efficacious for removing infirmity. Therefore in this way three things are touched upon in the words above: namely, the preparation of this medicine, healing from infirmity, and liberation from death. The preparation of the medicine is touched upon when it says, he sent his word. This should be understood as referring to the incarnation of the Word, who is said to be sent by God because he became flesh: God sent his Son, born of a woman (Gal 4:4). It should also be understood as referring to the institution of the sacraments, in which "the word is combined with the element and the sacrament is made"; so that in this way a sacrament is similar to the Incarnate Word. For sensible creation is sanctified by the Word of God and prayer (1 Tim 4:5). In accordance with the particular mission of the Saint Albert the Great Center for Scholastic Studies, which seeks to promote the study of theology according to the mind and method of the great scholastics, the core of every summer program lies in the attentive reading and thoughtful discussion of the great texts of the Catholic theological tradition. After Scripture itself, pride of place belongs to the Fathers and Doctors of the Church, and especially to St. Thomas Aquinas. Our verbal commentary on these texts, carried out in a formal seminar setting, is intended to approximate the scholastic practice of written commentary undertaken by the theological "bachelors" of the day. Participants in the program will be expected to read the assigned selections before each seminar in order to come prepared to participate in group discussion of the texts. Although every participant is expected to contribute his or her insights to aid the entire group in coming to a deeper understanding, these seminars will be guided by our program directors, Fr. Thomas Crean, Dr. Peter Kwasniewski, and Mr. Christopher Owens, who have advanced degrees in theology, competency in the subject matter, and experience in the seminar method of pedagogy. The second part of the program consists of a series of lectures delivered by our "masters" of theology, who consist of the Fellows of the Center, joined by members of the monastery of St. Benedict in Norcia. A keynote will be given by Fr. Cassian Folsom, O.S.B., the founder of the community. Topically, the lectures will complement the subject-matter of the seminars. The program reaches its culmination with our authentic scholastic disputation: the questions to be disputed will be announced at least one day in advance, and the participants divided into teams, which will be assigned to argue either for or against each question. Each participant will be expected to form his or her own thoughts on the questions, and attempt to answer them. At the disputation itself, members of each team will offer arguments in scholastic style as an objection or a ‘sed contra’ (“it seems that…” or “it seems not…”). After each team has argued its case, the "Master" of the disputation will give his solution, and then reply to each of the arguments posited by the participants. Throughout the two weeks of the program there will be ample opportunities for spiritual activities. Even though this past year has seen the devastation of the town and of the monastery, the monks are working with us to ensure that the spiritual needs of the program participants will be met. Holy Mass in the usus antiquior will be available daily, as well as various hours of the Divine Office. The priests of the monastery will be available for spiritual counseling, guidance, and/or confessions upon request. The enrichment of mind and spirit fostered by attentive reading of the Scriptures and participation in the prayers and liturgies of the monastery will be complemented by moments of relaxation and cultural activities. 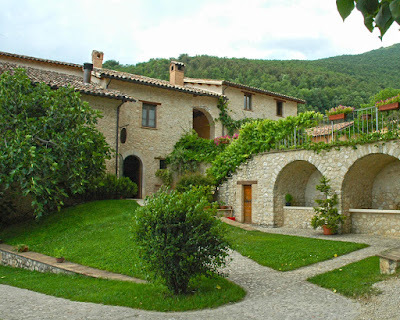 Optional excursions will be organized to nearby towns (places to be announced; in the past, we have traveled to Assisi and Cascia). The 2017 Summer Program is open to all applicants 18 years and older. The application process includes the completion of an application form and the submission of a letter of recommendation. Participants should plan some extra money for excursions, souvenirs, etc. Payment can be made by check, credit card, or paypal account. If paying with U.S. Dollars, simply calculate the amount necessary based on the exchange rate at the time of payment. Course Book: We are very blessed to be in partnership with the Aquinas Institute, who is giving us a substantial discount on the beautifully bound volume of St. Thomas' Commentary on IV Sentences (Retailed at $40). This will be included as a part of the program fees! Location: The 2017 Summer Program will be held in Norcia, Italy. Norcia is a small town in the province of Perugia in southeastern Umbria. 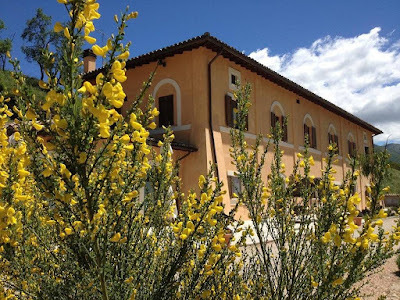 For directions on reaching Norcia, see Getting to Norcia. Course Credits: The Saint Albert the Great Center for Scholastic Studies is not a degree granting institution, but we will assign grades and provide official transcripts verifying completion of a four credit-hour course for those who are interested. A 350 Euro deposit is due upon acceptance. The deadline for applications is May 16, 2017. The remainder of payment is due by June 1. For online application and more information, visit the website. The location of the 2017 program, nearby the monastery "in monte"